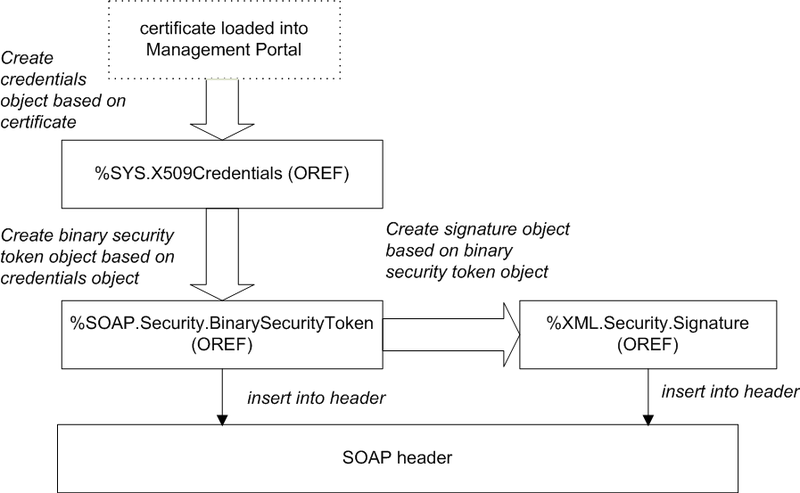 The chapter Using Derived Key Tokens for Encryption and Signing describes an alternative way to add digital signatures to SOAP messages. The chapter Using Derived Key Tokens for Encryption and Signing describes an alternative way to add digital signatures to SOAP messages. The details of the messages themselves vary, but the general process is the same and follows the XML Signature specification: You generate a digest of the signed parts, encrypt the digest, and include a <Signature> element with information that enables the recipient to validate the signature and decrypt the encrypted digest. signatureOptions specifies the parts to sign. This option is described in Applying a Digital Signature to Specific Message Parts, later in this chapter. referenceOption specifies the type of reference to create. For details, see Reference Options for X.509 Credentials, earlier in this book. The web service refers to a Caché credential set with this exact name. If you specify a credential set as the first argument (as we are doing in this variation), the default for referenceOption is $$$SOAPWSReferenceThumbprint. Optionally specify a value as described in Reference Options for X.509 Credentials, earlier in this book. You can use any value except $$$SOAPWSReferenceDirect. Send the SOAP message as usual. See the general comments in Adding Security Header Elements, earlier in this book. For information on validating <SignatureConfirmation> elements, see Checking the Signature Confirmation, later in this book.